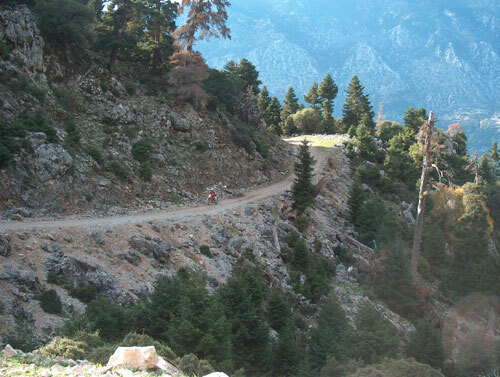 Off-Road in the Corinthian mountains? In 5 days. Nooo problem!!! With 12 inexperienced foreign riders, staying in luxurious hotels, visits of archeological sites and riding lessons. Marc Dammen (HondaPark Belgium), Chris Tassoulis (eXTra products) and Spyros Katsimalis (Off-Road.gr), organized a “different” route of the Corinthian mountains off-road, tarmac, with plenty of food, adventure, forests, rain, mud, dust, rocks, paths, lakes, cliffs and kilometers. 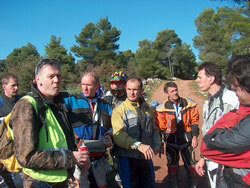 The idea was broached over the farewell lunch in honor of Marc, after last years “Rodopi Rally Raid”. A year later Marc, Chris, Thanasis and my self got together on a Friday morning in front of the hotel were the 12 riders had slept the previous night. Marc would take care of the communication, Christos the motorcycles and the support, Thanasis the general duties and myself the route and navigation. During the first day’s briefing, I discerned several feelings in the eyes of the riders ranging from fea, when they listened to the instructions about handling the motorcycles up the hills climbs covered with rolling stones, to excitement at hearing that we would stop for lunch at the Corinthian canal, were we reach after many kilometers off-road! “The guys” (between 22 and 58 years old) would use TTRs, XRs and Degrees motorcycles found by Christos. We considered them ideal: light, not a scary throttle and friendly to the riders. We would spend each night in a different place, so our personal belongings would be transported to each hotel in a van which at the same time would transport two backup motorcycles in case one of the main motorcycles presented a serious problem. Due to various reasons the group set off after 10:00. Warm up in the extraordinary hairpins of mount Parnitha and after 4 kilometers we went off-road. It was 28th of October and a big bright sun had dried up everything. Dust, rocks, which are quite usual for Greek riders, scared the friendly Belgians who -some of which- had only had the chance to ride on sand and dirt free of rocks. 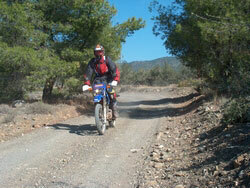 We soon reached the “Fili” intersection and took the old classic dirt road heading for “Vountima”. Near the creek and just before reaching the “Skourta” plateau, we stopped over a short break, exchange of impressions and evaluation of the trip so far. A doctor, member of the group, who had been riding off-road for the first time, had already crashed once and his Degree was lacking some… parts! The short break turned into a picnic in the country with biscuits, juice and plenty of chocolate. 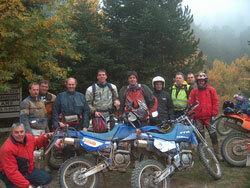 “Today we ride as far as “Trikala” Corinthias which will be easy, weather permitting”. Marc suggested not going directly off-road. 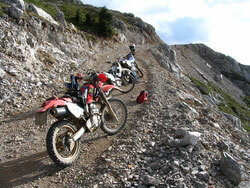 It would be just to give the inexperienced riders the chance to get used to their first off-road ride. We continued through village of “Pili”, we passed by “Vilia” and then, after a short trip through the pine trees, we went down the road towards “Psatha”. We could not help short breaks along the route to take pictures of the wonderful scenery. The “Psatha” coast simply breathtaking, unspoiled and wild fills us with peace. “Is it a lake or a sea?” What was taken for granted by us, was a reasonable question coming from our visitors. We have been riding along the sea flat out at 30 kilometers per hour (!!!) by the time we stopped to refill at a gas station at “Alepochori”. The riders had occupied the whole area which soon got crowded with arriving cars. At the moment it was quite hard to explain to the far-too-willing-to-drive Belgians that the gas station owner had simply closed the gas station in order to have lunch! Until that time, Jan became seriously sick and it was better for him to return to Athens . So Christos accompanied him, back to Athens to facilitate the procedure. We told the van driver to come and pick up Jan’s motorcycle and we set off once more with mixed feelings. A little bit later we went off-road towards “Gerania” mount. Damn, the road is too slippery and the bottom of the cliff looks very far. I choose the long route around mount “Gerania” since after “Loutraki” there would be no more off-road trip for the rest of the day. The winding road was flanked with pine trees, covered with rolling stones and dust. 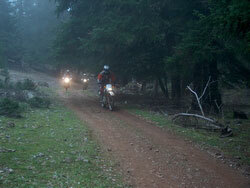 32 kilometers later we reached the center of “Loutraki” covered with dust. Time for lunch. And ideal lunch was souvlaki at Isthmia, overlooking the canal. We contacted Christos who informed us that they were at “Nikaia” hospital with hardly any doctors on duty. Christos would spend the night with him and would try to join us the next day. After we had taken the necessary photos at “Isthmos” we rode slowly from the old road as far as “Xilokastro” were we refilled. To reach “Trikala” we took the old road. Being full of turns, abandoned for years, in a bad condition, it gave riding a different sense!! Just before the intersection for “Trikala” it started drizzling. By the time we got to the “Kissa Hotel” light rain had turned into a downpour. That legendary hotel had recently been restored in a tasteful way. We have very little time to settle in our rooms, take a shower and have some rest before our evening meeting for briefing and reorganization. It got dark, the clouds have surrounded the hotel and it seemed that the next day there would be no dust at all. It did not stop raining all night long. Quick breakfast and further instructions due to the fog. From the very beginning we have been using system D. The navigator indicates the route and at every intersection the second one stops and waits for the last one to come. The third one becomes second and this way they all take it in turns and the group moves fast and goes on. Raincoats for the riders and instructions for the van driver to wait in the middle of the route. We started riding with caution through the village. There was thick fog and some drizzling. We decided to ride down and take the dirt road soon after “Pitsa” which leads to “Karia”. A big circle. 3 kilometers off the village the weather cleared up, the fog disappeared, the rain stopped and the group started to enjoy it again. We took the dirt road and started going up. Many of the dirt roads were in poor conditions and practically forgotten. At a certain point we entered the first footpath. 300 meters further at an old bridge, we had our first stop to smoke a cigarette (those that smoked anyway), to eat chocolates (the ravenous ones) and take photos. Everybody was more than happy. They acted like excited children playing with a new toy. 300 m off-road and they felt blissful and I shared this feeling with them! We are already high enough; the rain of the previous night had thoroughly watered the earth turning it into mud. Sliding is unavoidable while the mist created a fairytale atmosphere. 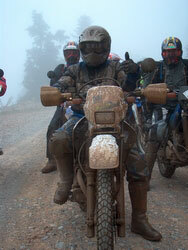 Soon after the monastery of “Esodia of Theotokou”, the road turned into a muddy hell. The last 5 kilometers before reaching the “Karia” tarmac proved quite “educational”. 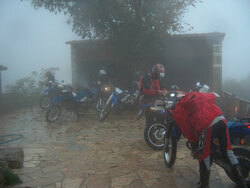 A few kilometers off road and the group came out of the mist at “Dasiou” lake. This is were the course took place. The riders were divided into 2 groups: beginners and experienced. The experienced ones followed several paths through the incredibly beautiful forest of the area while the beginners moved to the nearby truck were they were initiated into the basic techniques by Marc. 1 hour later we continued the route through a narrow lane. The trees were so thick that you could hardly see the sky. Imagine how it was like for someone who had never ridden his bike off-road. The sense of an ideal route. We reached the so called “horses” plateau (were wild horses run freely) over “Goura” and we met 4WD friends who were looking for the way to the village. We gave them instructions and we went on descending to “Messino”. Narrow road, rolling winding stones, full of jumps, with a cliff making our adrenaline run high. After “Messino” we reached “Doxa”(Feneos) lake where we stopped at the chapel at center of the lake. Our stomachs were rumbling and the “Doxa-Zarouxla” route completed with rally raid tempo! We reached the tavern of the village at the busiest time (15:30) making it difficult for us to find a table for 14! The food was perfect, we practically ate everything. Our evening meeting was in “Nafpaktos” it was about 17:00 and we had just ordered coffee and desert. The group was extremely excited, our spirits were high due to wine and there was no reason for us to hurry. In the end we rode slowly to “Akrata” and after stopping on the “Rio-Antirio” bridge to take photos we end up at 20:00 at the luxurious hotel. Our van was already there and Christos had ridden his BMW back to our party. I know it is hard to believe but once again we went out to dinner! Early rising for the... organizers. We should service 14 motorcycles! The sun was shinning and Christos who was waiting for us finally decided not to load his heavy BMW on the van but he would do on it (with tarmac tires) the route of the day. Tarmac tires, evidently, was no object for him! We said goodbye to Thanasis who had to go back to Athens on business. Mountainous Nafpaktia and mount Giona were waiting for us. After the first kilometers on the tarmac which brought us into the mountain, a quick stop and off we went into the woods. Change of greenery with deciduous trees, in autumn colors, sandy land free of rocks. The winding uphill route challenged us to games. Several intersections but the group moved swiftly despite its volume. We were bonded now, everything happened automatically and we enjoyed the ride. 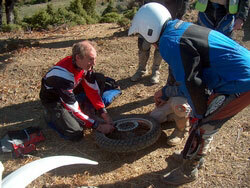 In “Tricorfo” a hill climb lesson took place. 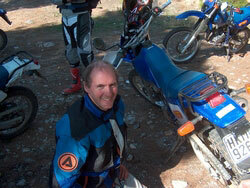 We choose the toughest natural route to the top, instructions to each rider and vroom…. Party at the top of the mountain! The sun had dried the soil making it dusty. Far ahead “Mornos” lake appeared. 8 kilometers down road the game started. Chris with BMW, Marc with TTR and “Duck” with Degree took part. The winner would be the one to ride 8 kilometers down road with turned off engine. And the winner was Christos with his heavy BMW although he was on tarmac tires. Not even once did he slow down. Marc and Duck followed. Games on the sand, on the shore of the lake. Dakar is here!!! Quick lunch at “Lodoriki” and vroom for “Giona”. The west side of the mountain was very steep and there was only one narrow, winding road on the brink of the cliff going up. It started at the east edge of the lake and climbed almost vertically. Rocks, rocks, rocks and cows, lots of cows for at least 20 kilometers. The view was simply stunning. There were no trees the atmosphere was crystal clear and we started shivering with cold. “Amazing special stage!” exclaims Tassoulis. “It does not matter. Would trees make it look any better? Stay on the road. The rest is of no importance”. 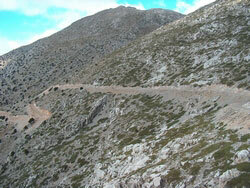 We reached “Triseli” and start going downwards to “Taratsa”. A little bit later we met an Acropolis Rally special stage “Karoutes”. The perfect end for the day. Descent, wide slippery road, non ending side slides. We reached “Agia Efthimia” sweaty and tired. Stop for a cigarette to calm down. Everybody was grinning. A few more kilometers off-road and we finally reached our hotel in “Itea”. The usual stuff: a quick shower, chitchat and, of course, tremendous quantities of food, this time seafood. 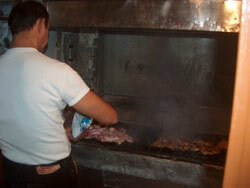 On Monday Christos got up early and rode on his BMW taking the way back to Athens. The weather got worse and “Parnassos” is hardly discernible. A quick stop at “Delphi” –we took a look around- and then we went on heading for the mountain. It was icy cold! Our fingers got frozen on the γκριπ. We changed schedule. Instead of a long ride on mount “Parnassos” we took a short one and move lower. Everything is wet and I chose a new route which I was familiar with since the 2nd day of “Roumeli 2004 Rally Raid”. Short stop at “Gravia” for coffee, tea and hot chocolate in order to get warmer. We set off for “Iti”. Slippery grass and mud raise our adrenaline high during the downhill towards “Papadia” bridge. 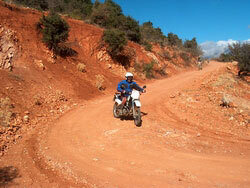 Those that had participated in the 2004 Rally Raid must remember the “rocky road” before the “Eleftherochori” lakes. Imagine it wet, foggy and drizzling. Those who hadn’t fallen off by that time, had the chance to do it then. The hope that the situation would “get better”, when entering the road to “Mendenitsa”, vanished into thin air on its first hairpin. Even walking was too difficult. We went on with difficulty riding along the edge of the road. Only a few kilometers before “Mendenitsa” the situation became normal again since the ground turned rocky. The off-road route “Medenitsa-Kallidromos” would have been impossible to find if I had not passed by so many times when drawing the 2004 route. We went down the slope, we passed by “Kallidromos” and reached “Regini”. However, the day was long and hard and a couple of our riders were ready to give up. A decision was reached quickly. The tired ones would ride on the tarmac to “Livadia” with Marc and the most experienced ones would go on off-road at a quick pace. The quick wide road with lots of jumps and the fact that now our group consisted of the more experienced riders, “eager-to-ride” off-road, resulted in flat out riding. We were so excited that we hardly realized how quickly we reached the challenging down hill road. At dusk we reached “Orchomenos” We slow down, we kept on with lights on and before getting completely dark we reached “Livadia”. We were completely covered with mud which made it difficult for us to enter the marble hotel. Marc got there before we did and was waiting for us in the parking lot holding the hose, of course not for the motorbikes but for the riders. Having eaten just a sandwich we were hungry like wolves! Too sorry to come back! We had to be back to Athens by 14:00. In the meanwhile it did not stop raining all night long and the fog outside the hotel was thick. The time was limited but the guys wish for some more off-ride road. We came back taking the national road. We stopped at “our mountain” Parnitha. We got there at half past ten and we had a chance to see most of it. It was Tuesday morning and there was not a single soul in the area! Paths, rocks, wide smooth roads, we tried everything! And not just that. 2 more lessons followed. Riding over trunks and going up and down a slippery uphill. The first one was given by Marc on a classic path and the second one in a slippery uphill. Five days in the mountain and the “inexperienced” riders of the first day went through all the difficulties we found on wet “Parnitha” with ease. Their improvement was amazing! Unfortunately, nothing lasts for ever and so at about 14:00 we reached a gas station close to Athens to clean our motorbikes. The guys were excited but also sad because their trip was about to end. They were looking forward to their comeback next year joined by others and of course we will prepare new challenges for them. But, we did not say goodbye there. A rich dinner and the last Phill Collins concert followed. We had already booked the tickets and together with Jan who had completely recovered we had fun till late that night. Is Greece a paradise for off-road riders in Europe? Not only do we have the right terrain but there are also high standards of facilities, people with excellent knowledge of the object, archaeological sites and great will. The participants got their “homework”, to fill out a special form commending on the negative aspects of the trip, because to know negative aspects will help us bring about improvements. What I can say in all certainty is that the satisfaction I could see in their eyes every time we did a bit of the route filled me with content till the next time. A few days later when we talked this over with Marc, he reaffirmed the excitement and the satisfaction of the riders. The preparations for the next trip have already started!